Sean Connery's fourth Bond film, Thunderball, slips from the peak of From Russia with Love and Goldfinger, but still provides plenty of thrills of the brand only 007 can provide. 131 min. United Artists Films. Director: Terence Young. Cast: Sean Connery, Claudine Auger, Adolfo Celi, Luciana Paluzzi, Rik Van Nutter (II). Sean Connery's fourth Bond film, Thunderball, slips from the peak of From Russia with Love and Goldfinger, but still provides plenty of thrills of the brand only 007 can provide. Reclaiming his spot as director from Guy Hamilton, Terence Young once again proved his knack for large-scale action with this watery adventure. Though at 131 minutes, Thunderball is also a bit waterlogged, it effectively follows the now-established Bond formula with beautiful women, a smooth, strange villain (Adolfo Celi's eyepatched Emilio Largo), and widescreen spectacle. Thunderball also holds an infamous place in Bond history due to the legal wrangling that has perpetually surrounded it. The screenplay is credited to Richard Maibaum and John Hopkins, but the story is credited to Kevin McClory, Jack Whittingham and Ian Fleming, the three men who originally developed it as a failed screenplay before Fleming turned it into a novel. A legal settlement with McClory made possible the unofficial remake Never Say Never Again, with Connery returning to the role of Bond twelve years after abandoning it (McClory nearly made a second remake, with Timothy Dalton, in the late 1990s). Bond's mission involves finding atomic bombs stolen from a NATO plane. With the world held hostage, Bond must track the weapons, held by SPECTRE mastermind Largo, with the help of the baddie's "kept woman" Domino (Claudine Auger). Thunderball's memorable opening begins with a closeup of a coffin bearing a "JB" monogram and ends with 007 taking flight on a jet-propelled backpack (a stunt performed by an Army operator wearing a working model). Underwater brawling with spear guns and sharks and the exciting transformation of Largo's ship, the "Disco Volante," contributed to the film's visual appeal (it would win an Oscar for special effects). 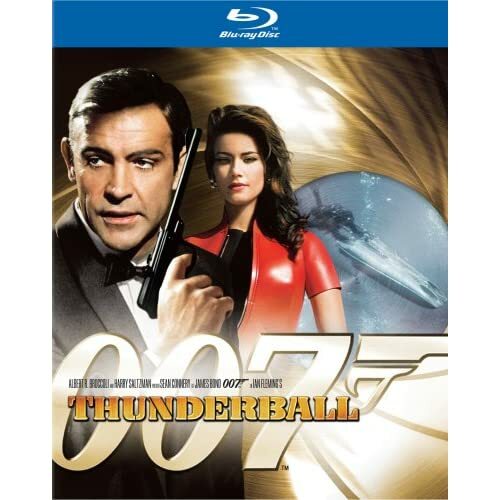 Thunderball includes appearances by series regulars Bernard Lee ("M"), Lois Maxwell (Miss Moneypenny), and a delightfully testy Desmond Llewelyn ("Q"); CIA ally Felix Leiter also returns, in the colorless form of Rik Van Nutter. Ken Adam again supplies the stunning sets, and Maurice Binder the colorful title sequence, set to Tom Jones' brilliant hoot of a title tune. Aside from the watery adventure, Thunderball may be most memorable for the continued refinement of the dangerous game of the hero letting the villain know Bond's on to him. The dynamic leads to delicious, barely veiled verbal jousting, as when Bond comments to Largo, "That gun. Looks more fitting for a woman." "You know much about guns, Mr. Bond?" Largo asks. Bond replies, "No, but I know a little about women." 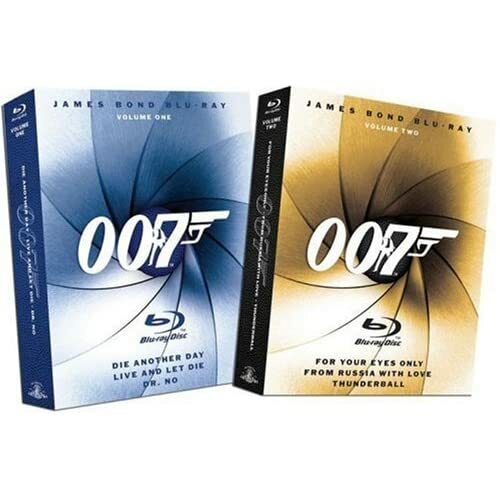 Part of the new Blu-ray wave of Bond releases, Thunderball looks stunning in a full-HD transfer of the Lowry Digital restoration, along with the full suite of extras from the recent DVD Ultimate Edition (with two key featurettes kicked up to full HD!). Without sacrificing the filmmaker's original intent, this ultra-widescreen 2.35:1 transfer makes the decades-old film look good as new. A frame-by-frame process leaves Thunderball looking spotless, colorful, tight, and gloriously detailed. As remastered in DTS-HD 5.1 Master Lossless Audio, the film's soundtrack has never sounded so good on home video. Fox deserves kudos for including not only a creative 5.1 mix but the film's original mono track, so purists can make up their own mind as they view and review this old favorite. As with all of the Bond titles, Thunderball comes with a staggering array of bonus features. 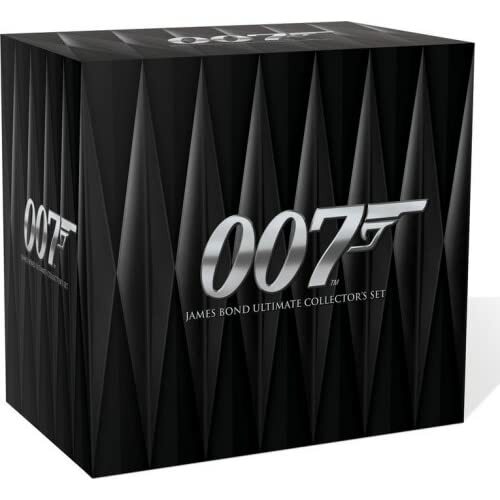 The audio commentary narrated by Bond historian John Cork gathers comments (recorded separately) by director Terence Young, actors Luciana Paluzzi, Desmond Llewelyn, Lois Maxwell, Rose Alba, and Molly Peters, composer John Barry, special effects technician Bert Luxford, production designer Ken Adam, and underwater specialist Ricou Browning. The track covers the cast and crew, stunts, effects, story and script development, underwater photography, and the score. A second commentary with editor Peter Hunt and co-writer John Hopkins again has Cork as a host, with Hunt and Hopkins recorded separately. Particularly nifty is a break in the narration so we can hear the movie’s original theme song played over the credits; later, we get samples of the international dubs for a few sequences. Declassified: MI6 Vault begins with the 1965 NBC TV special "The Incredible World of James Bond" (50:50). The show includes film clips, a few comments from Fleming, some set footage from Thunderball, and some making-of material. "A Child’s Guide to Blowing Up a Motor Car" (17:07) is a 1965 Ford Mustang promotional film that includes behind-the-scenes footage of a car explosion from the film. "On Location With Ken Adam" (13:07) presents Adam’s home movies of location scouting and the like narrated by the man himself. "Bill Suitor: The Rocket Man Movies" (3:54) similarly has Suitor narrate footage of his stunt flights in the rocket pack. "Thunderball Boat Show Reel" (2:50), introduced by Michael Wilson, is a vintage piece produced for a 1965 boat show. Of particular historic interest: an alternate version of the movie’s climactic underwater sequence. Selling Bonds comprises three original 1965 TV commercials: "007 Raincoat" (0:32), "007 Slacks" (0:34) and "007 Action Pack Toys" (1:01). 007 Mission Control Interactive Guide includes "007," "Women," "Allies," "Villains," "Mission Combat Manual," "Q Branch," and "Exotic Locations." This selected scenes menu offers "extra," except for the opening credits without text (3:00) and, in "Locations" (3:18) a set of clips narrated by Maud Adams. Mission Dossier begins with the "The Making of Thunderball" (27:31), narrated by Patrick Macnee. Participants include Llewelyn, Adam, Browning, Paluzzi, Peters, Maxwell, Young, associate producer Stanley Sopel, Goldfinger director Guy Hamilton, actors Martine Beswick and Sean Connery, chief draftsman Peter Lamont, special effects supervisor John Stears, and production buyer Ron Quelch. The doc covers the legal wrangling that led up to production (and that has caused problems for decades), the selection of cast and crew, the underwater photography, the opening sequence, stunts and effects, boats and sets, locations, and the movie’s eventual reception. Also narrated by Macnee, "The Thunderball Phenomenon" (30:59) focuses on the film's media blitz and impact, with talking heads Maxwell, Peters, Stears, Paluzzi, Beswick, Llewelyn, Lamont, writer Richard Maibaum, Ian Fleming Foundation president Michael Van Blaricum, UA art director Donald Smolen, James Bond 007 Fan Club president Graham Rye and ABC News correspondent Bill Diehl. "The Secret History of Thunderball" (3:47) explains the differences between various releases of the film, including overdubbed vocals and various scene deletions. Ministry of Propaganda includes three Trailers (two from the film's original theatrical release; one for a double bill re-release of both Thunderball and You Only Live Twice), five TV Spots, and 10 Radio Spots. An Image Database includes 150 photos in 11 sections. All site content © 2000-2019 Peter Canavese. Page generated at 04/23/2019 07:39:51AM.